This 12 Days Everest Base camp helicopter trek is undoubtedly an epic trek and the best way to perceive the ambiance of Everest. Everest Base Camp Trek is certainly a one in a million occasion which is not to be missed. It takes you to the spectacular unique region of the Sherpas with mountains so close to your soul. It’s a world heritage site with impressive mountain views, pleasing landscapes and introduces you to the Tibetan Buddhist culture. The region of Everest is very well fenced by the secret valleys and grandiose mountain peaks which lures thousands of mountain lovers every year. Everest Base Camp the height of which is approximately 5,360 m / 17,585 feet has always succeeded to tempt every single mountain enthusiasts with its persuasive charm and elegance. It has always been a dream of many mountain lovers to be at the base of the world’s highest mountain. However, there are ample amount of Everest trekking packages for the travelers to pick depending on their convenient time frame. 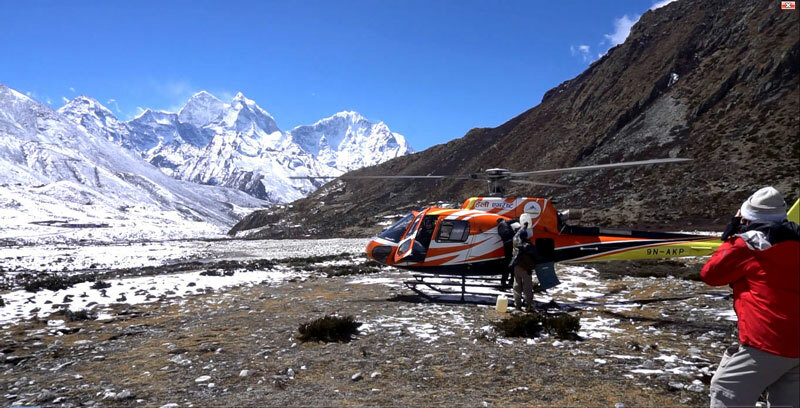 Nevertheless, this 12 Days Everest Base camp Helicopter trek is intended specially for people with limited time frame. It’s for the people who have tight time schedule with no options to trek to Everest base camp and walk back. The feeling of getting close to the base of Everest and the spectacular Khumbu Ice-fall is simply phenomenal. During climbing season it is treasuring to observe colorful expedition setting which is absolutely exceptional. With Everest Base Camp Helicopter trek anyone have the opportunity to experience all the excitements of trekking and flying back to Kathmandu that offers the impressive aerial view. We take the most thrilling flight to Lukla and walk the legendary trail that leads us to the first destination of Phakding. Gradually we ascend towards the alpine area with the 360 degree of mountains. The mountain setting as we proceed further is very dramatic. Every day there is a transformation in the mountain terrain and the views. There isn’t a single day that would come up with any disappointment. Every day is beautiful. Eventually, we get to Gorakshep at the height of 5,189 m /17,024 feet our highest sleeping elevation. Finally after walking for next 2 and 1/2 hours we get to the first stepping point of the world highest mountain. The sense of achievements after this point leaves with absolute contentment. Nepal Pyramids itinerary is so designed that there is always enough room for healthier adaptation to the thin air environment. After we are done with our trek we fly our way back in a Chartered Helicopter. Tracing back our trails through the untouched valleys with the birds eye view is unbelievable. DAY 04: Acclimatization day at Namche / Morning Excursion. DAY 05: Trek to Khumjung (3780 m/12,401 ft) - 2/ 3 Hours - Side Excursions. DAY 08: Acclimatization day at Dingbuche / Morning Excursion. DAY 12: Departure Day - Transfer to International Airport. ⭐ Flying in a small plane to the world’s most thrilling mountain airport of Lukla at the elevation of 2840 m is more adventurous and astonishing. ⭐ There is undoubtedly lots of excitement and fun getting to Namche Bazaar, the capital of Khumbu region through several high suspension bridges. ⭐ Going over one of the suspension bridge, considered highest in the region of Everest is adventurous. ⭐ Beautiful walk to the village of Khmujung, popularly known as the valley inside the clouds and visit to the Monastery to witness the Scalp of mythical creature [Yeti] will surely add up to your legendary quest. ⭐ Visiting the School built by Edmund Hillary around 1961 gives you the accounts of his life’s devotion for the Sherpa people of Everest. ⭐ The close view of the magnificent mountain, extensive green hills, the Tibetan-Buddhist culture and to witness the territory of the yaks from Khumjung and onward is magnetic. ⭐ Walk to Dingbuche with its extravagant mountain views at 360 and staying two nights at the base of soaring Amadablam (the Matterhorn of Nepal) is a very enchanting experience. ⭐ Being at the base of the world’s highest peak, Everest and getting to the summit of Kalapathar 5545 m/ 18192 feet is a great accomplishment. ⭐ Flying in a HELICOPTER from Gorak Shep through the valley of Everest is an experience away from the world. ⭐ The aerial view of the valley, gorges, and the closer view of the mountains is something unbelievable. Once you land in the Tribhuwan international airport of Kathmandu airport your group leader will transfer you to the hotel. Your leader will brief you on ‘what’s next’ program and meet you around in the evening for the trek briefing and welcome dinner. Trek briefing and giving away of equipment. 35 minutes awesome flight to the Lukla airport. 3/4 hours effortless walk through the cultured Sherpa villages to our first destination, Phakding. On your way the views are of exceptional beauty. Furthermore, the view of stunning landscape, deep valley and Dudh Koshi gorge is unique. Beautiful view of deep gorges, ancient farming terraces and soaring landscapes. The very special scenic beauty at the backdrop is amazing. Namche Bazaar is the Administrative Centre and the Capital of Khumbu district. We start early today as we need to cover 7/8 hours in distance. Despite long hours walk the fascination of trekking into the legendary trail is very delightful. Once you get to Namche you would witness a luxurious city in the middle of no way. It is very surprising to see the comfort in the midst of remoteness and thin air. Crossing of 5 high suspension bridges including the highest in the Everest region is really exciting. The scenic beauty, deep gorges and sky-high cliffs at the backdrop is phenomenal. Walk to Everest View Lodge, one of the enchanting place for the view is remarkable. DAY 05: Trek to Khumjung (3780 m / 12,401 ft) 3 hrs. Visit to the yak farm, school built by Edmund Hillary and the Khumjung monastery to witness the scalp of the YETI is another legendary quest. DAY 06: Trek to Phortse (3,810 m / 12,500 ft) 6 hrs. We skip the maddening traditional trial to Everest base camp and divert our way to a different valley of Gokyo. This gives you an opportunity to explore the lower section of Gokyo valley with the most amazing setting. We climb all the way to ridge of Mong La village and descend all the way down to the river valley of Phortse Tenga for Lunch. After lunch short easy hike through the forest of rhododendron to the most amazing settlement of Phortse. Fabulous walk to the ridge of Mong-La with stunning mountain views. Leaving Phortse we take one of the most beautiful hill cut high trail. This high elevated trail offers the most outstanding views of enormous mountain and deep valley. Today we start early to get to the village of Dingbuche, a town situated at the foot of soaring Amadablam Mountain. Amadablam also known as the Matterhorn of Nepal is yet another attraction. Once you get to Dingbuche you would realize that now you are completely fenced by the soaring snow peaks, 360 angle view. 4 hours to the pleasant settlement of Pangbuche. Another 45 minutes’ walk to Somare for lunch. Next painless walk to Dingbuche where the valley opens wide with its magnificence. View of countless other neighboring mountains that now opens clear. After breakfast we climb to the hill of Nagarjun for acclimatization. From the point of excursion, aerial view of Island peak valley and Dingbuche village. DAY 09: Trek to Lobuche (4910 m / 16,108 ft) - 4-5 hrs. Now we walk into the alpine area away from the tree line. Gradual ascent is recommended to all the trekkers. Try to breathe normal. Today is another beautiful walk. We walk into the wider trail much like the Himalayan meadow. You would see countless new snow peaks that unfolds before us. In this contrasting and spectacular landscape setting there is serenity and contentment. You will feel the thin air. Slow walking is highly recommended. Walking up to the memorial plateau with hundreds of memorial built after the memory of people who met with tragedy in different mountains of Everest is remarkable. Getting to Lobuche a small settlement at the foot of Lobuche peak is significant. Leaving Lobuche this 2/3 hours walk to Gorak Shep is out of the ordinary through the rocky moraine undulating trail. Gorak Shep, the spectacular village is surrounded by majestic snow peaks including Everest, the world’s highest. There are hardly any trails as you are walking into trail with live glacier underneath that changes its course every year. Soon we are done with lunch we will walk to our chief mission of getting to E.B.C. Spectacular view of the Khumbu ice fall with sky-high peaks all around. Now is the time for epic climb to Kalapathar, the point to value your dream and the sensational Himalayan vistas all around. The climb is challenging but the view from the top surpasses the wildest imagination. After making historic success to Everest Base Camp and Kalapattar, we will get back to Gorakshep for breakfast and take Chartered Helicopter back to Kathmandu. A very rewarding moment being at 5545 m with exceptional panoramic mountain view. Flying in a Helicopter back to Kathmandu is simply incredible. The aerial view of the valley you just walked looks interestingly overwhelming. You get very close to those mountains which you recently witnessed way far from a distant. Depending on your flight schedule airport transportation will be provided. Your leader will accompany you.